The man who touts himself as the chief of Gbese, Nii Ayi Bonte II, yesterday suffered an embarrassing fate when president-elect, Nana Addo Dankwa Akufo-Addo, called on the Ga Traditional Council at Dodowa. Nana Akufo-Addo had gone there to thank the chiefs and the queen mothers for their support during the 2016 electioneering campaign – which saw him elected as president. He went there in the company of his wife, Rebecca and party kingpins, including Acting General Secretary, John Boadu; Regional Chairman, Ishmael Ashitey; Professor Mike Oquaye; Stanley Adjiri Blankson; Ayikoi Otoo; Laud Commey; Nii Ayittey Boafo and some of the NPP’s elected Members of Parliament in the region as well as those who failed in their parliamentary bids. A few days to the December 7 elections, an emotionally charged Nii Ayi Bonte II – famously known as Tommy Okai – was seen at a public function largely attended by members of the governing National Democratic Congress (NDC), vowing to destool himself if the NPP’s candidate (now president-elect), was voted as the president of Ghana after 7th December, and subsequently sworn in on 7 January, 2017. Nii Ayi Bonte claimed that (outgoing) President Mahama and the NDC government had done more than enough in terms of projects hence, was sure they would win the elections and decided to put his stool [even though not the rightful occupant] on line. Interestingly, the man has since gone silent after Akufo-Addo was declared winner of the election, as many people, including his own people in Gbese, have begun to call for his head. Luck eluded him when Akufo-Addo (now the president-elect) and members of his team entered the hall where the meeting with the Ga Traditional Council was to take place. Minutes after they had arrived at the place, Tommy Okai, former chairman of Accra Hearts of Oak Football Club, started taking cover, hiding his face. He had gone to sit far behind the crowd where he could not be easily identified, with his body language telling of a man feeling quite apprehensive, whiles trying strenuously without success to swerve the prying eyes of journalists and the cameras. 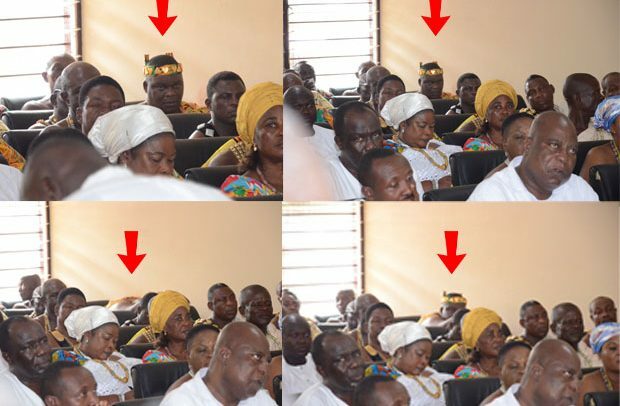 Throughout the programme which lasted close to 30 minutes, Nii, who was fully dressed in a chief’s regalia, was seen bending his head to avoid being captured by the cameras. Try as he did, the media men, especially the photographers, managed to capture him from the distance with their sharp lenses. Many were those who thought the chief would be apologetic enough by eating back his words to go and greet Nana Akufo-Addo after the event as he [the president-elect] and the chiefs and queen mothers exchanged pleasantries, but the self-acclaimed chief was nowhere to be found, obviously shy to go close.